Anyone who goes trekking or backpacking regularly, knows the problem. Space for luggage is limited, so packed gear needs to be as light as possible and able to be stored compactly. For anyone who still doesn’t want to miss out on the comfort of a sleeping mat, there is now a further variant of the popular self inflatable sleeping mats from Outdoorer – the Trek Bed 3! The special thing about it is its size of 193 x 63.5 x 5 CM and its low weight of about one kilogram. The Trek Bed 3 is available at Amazon. 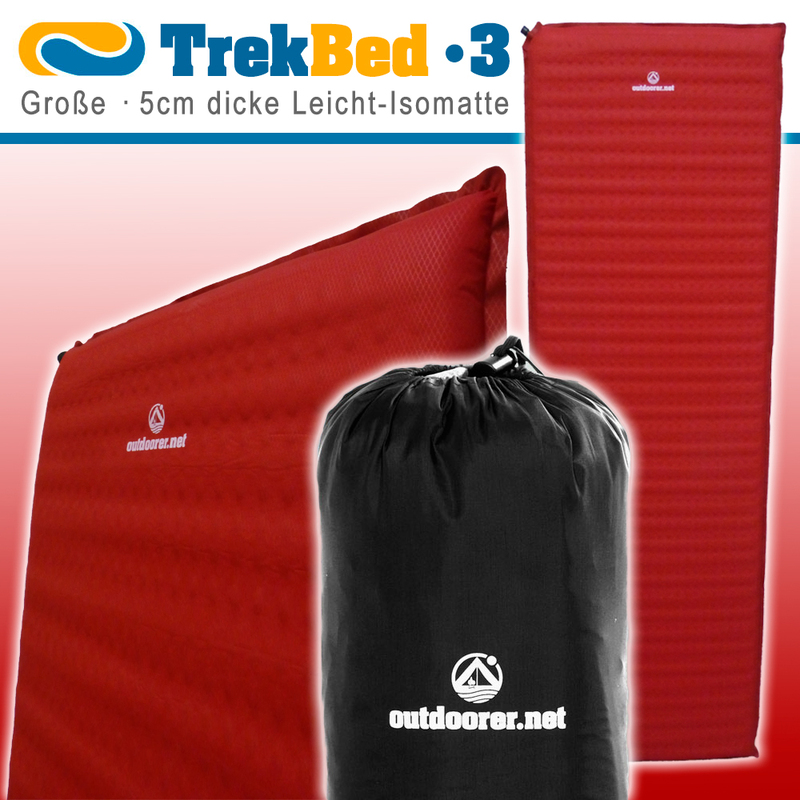 The Trek Bed 3 not only combines all the important characteristics of an optimal trekking sleeping mat, being lightweight and packable, but it is also very comfortable to lie on. With a width of 63.5 cm and a height of 5 cm, a good night’s sleep is guaranteed. You will not feel any lumps or bumps in the ground. The weight of approximately 1 kg means it is still very light and easy to stow away in a backpack. For the upper, quality 75D polyester was again used. Although it is very strong and robust, the Trek Bed 3 is a comfortable bed with diamond embossing. Because we have your health at heart, we obtain the material for the upper from a dealer with Eco-Tex 100 certificate. This certification means that no hazardous substances are used during the manufacture. The base is slip resistant and also waterproof. Durable 70D nylon is used for the bag. The self inflatable mattress Trek Bed 3 impresses with its stylish design. Its typical contours are created by punching the foam horizontally and vertically. This not only enhances its appearance but also reduce its weight and means that the mat can be folded to a very small size. It still protects you very well against the cold from the ground. The R-value is 4 so you can use throughout the year, down to -11 degrees. The rounded edge prevents the valve from being damaged when multiple mats are used next to each other. The self inflatable sleeping pad is very easy to use. Spread out the mat and open the valve. The Trek Bed 3 inflates by itself. You don’t need to do anything else, just wait about 15 minutes and then close the valve. If you prefer a harder sleeping pad, just blow in extra air. There is then nothing in the way of a good night’s sleep. In the morning you open the valve, fold the mat together in the centre and then close the valve. 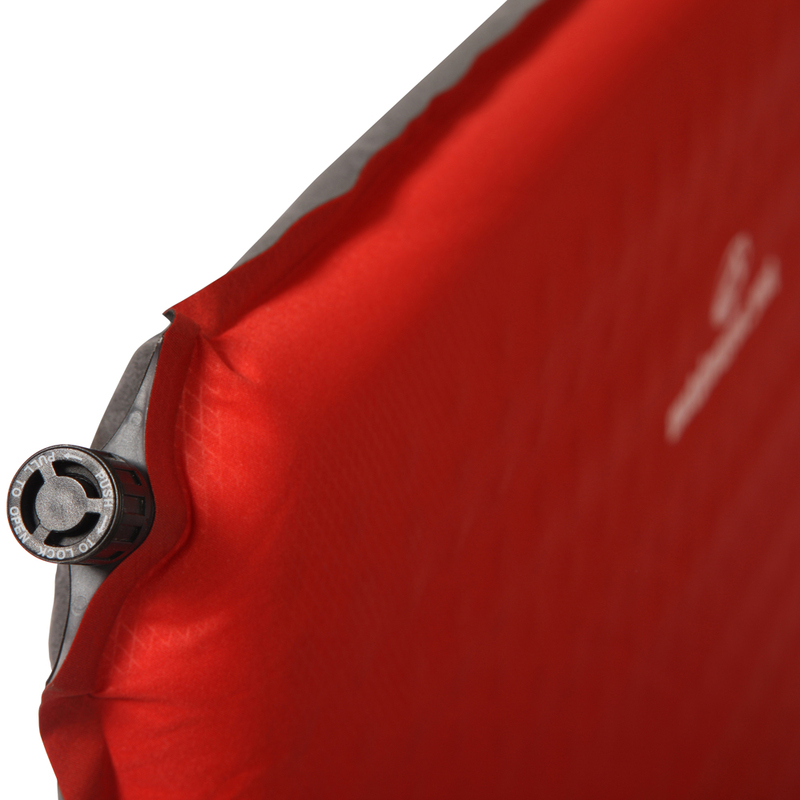 Your sleeping pad Trek Bed 3 is well protected from damage by the robust material. But nothing is more annoying than suddenly to have a broken, unusable mat on a tour. Therefore when you purchase the Trek Bed 3 a repair kit for emergencies is included. Where can you buy your Trek Bed 3? You can order your Trek Bed 3 at Amazon.